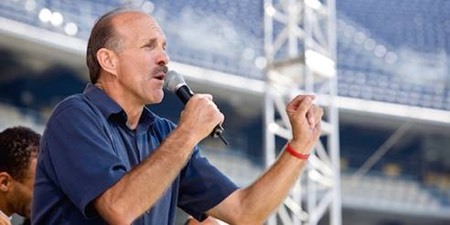 "Lou Engle's Word About the Elections! A Call For a 40-Day Fast Starting Today!" There are moments in history when a door for massive change opens. Great revolutions for good or for evil occur in the vacuum created by these openings. It is in these times that key men and women – even entire generations – risk everything to become the hinge of history, that pivotal point that determines which way the door will swing. America is in a defining moment. We believe that right now Heaven is looking for those who will shift our nation into a new day of mercy on a 40-day fast. Over the last 20 years we've seen major shifts take place as the Body of Christ united in extended fasts. Even now, TheCall Team have locked themselves away for 40 days in Colorado Springs to fast and pray for a Third Great Awakening and for a shift in these elections. We believe we are in some kind of an Elijah/Jezebel showdown that will frame the future of our nation. In our gatherings together, God began to give us revelation. One young lady who led us in renewing covenant at the first Call in Washington, DC had a dream recently. In the dream she was in DC and there was a huge celebration going on in which masses were reveling in the release of liberal laws and the throwing off of our Biblical foundations. She said it was terrifying as she watched the crowds get in buses to take that celebration through the nation. We believe we have come to a moment to stand again for the covenant of America and to uphold The Constitution. 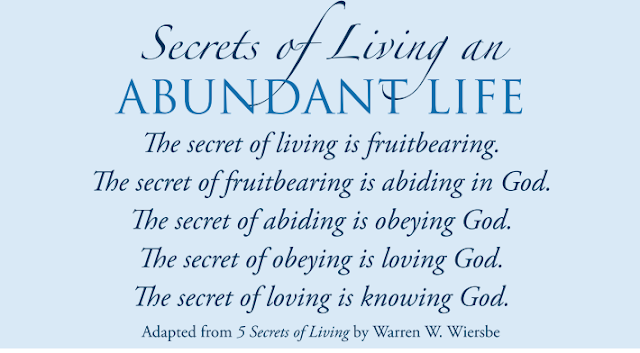 In doing so, we must first repent of all covenant-breaking in our own lives. We can't bind what binds us. When Daniel began to intercede for his nation in Daniel 9, he pleaded the covenant and asked forgiveness for his sins and the sins of his fathers so that he could remove accusation from the nation. This is how he appealed for the great return out of Babylon and the rebuilding of the temple. We are in a Daniel 9 moment in the Body of Christ. For this reason, we believe that this next 40 days of fasting from September 30th through the elections could be a hinge of history moment. Let us go to the courts of the King and hold up our constitutional document, begging forgiveness where we've broken the covenant, and pleading mercy over our nation that we would return to the foundation that's immovable. Brothers and sisters, we believe that this could shift history. "I Looked For a Man to Stand in the Gap"
Another dream was given to us, and in this dream a young lady from Alaska saw the White House and in one room was Hillary Clinton and in another room was Donald Trump. Trump was kneeling down weeping and broken and she said that in the dream she knew that people didn't know the kind of man he really was. In the dream he had the Bible open and he was reading Ezekiel 22:30, "I looked for a man to stand in the gap." Brothers and sisters, we must judge these dreams as prophecy. If they are God then we are in a defining moment for the covenant of this nation to stand and the covenant of our forefathers to be released for a Third Great Awakening. God raises up one and brings down another. He's the One who promotes kings but intercession can shift the mindsets of men and women all across this nation. I'm calling all of those that I'm connected with that know me with TheCall to take 40 days and pray and stand in the gap – 40 days of fasting, that God would raise up righteousness in the high places and loose another Third Great Awakening. Who knows but for such a time as this we've been brought into the Kingdom. Sometimes we give elections to Caesar when Caesar was never to have the authority over the elections. I remember in 2000 when we were praying for a pro-life president. Even during the primaries a friend of mine had a dream and saw George Bush with McCain in a battle in the primaries. In the dream he saw spiritual warfare going on over the top of the primaries and then he read a line, "Render unto Caesar what is Caesar's but render unto God the things that are God's. Profoundly, the interpretation came to us, that there was spiritual warfare over the elections. Therefore, only the Church could deal with that dimension because politics can't deal with the dimension of spiritual warfare. God was saying don't render the elections to the political process as to Caesar. It hasn't been given to him. It's been given to the praying Church. Right now in these elections do not give the future to Caesar. It's not been given to him. Render unto God the things that are God's. God is the Lord of the political realm! • For more information and to Download the "Fast Forward America Prayer Guide" click here. 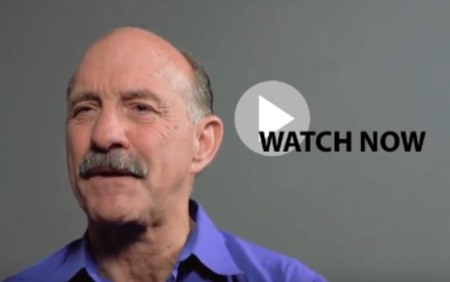 • Watch the "Fast Forward America" video with Lou Engle here or click on image below calling for a 40-Day Fast! God’s Thoughts About You are Only Positive. For the weapons of our warfare are not of the flesh, but they are divinely powerful for the destruction of fortresses. We are destroying speculations and every lofty thing raised up against the knowledge of God, and we are taking every thought captive to the obedience of Christ, and we are ready to punish all disobedience whenever your obedience is complete. …You are looking at things as they are outwardly. If anyone is confident in himself that he is Christ’s, let him consider this again within himself, that just as he is Christ’s, so also are we. God is remodeling our lives. He is renovating us. He is restoring us. He is rebuilding us. He is renewing us. 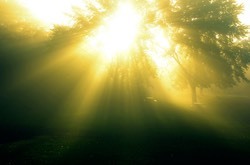 And the way in which He is doing it is by restoring a better way of thinking as a prime piece of our spiritual walk. 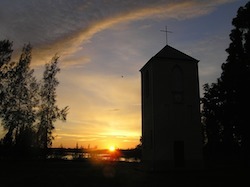 The Holy Spirit is destroying speculations, theories, surmisings, guesses, and pulling down any way of thinking that is against the true knowledge of who God is for us.5 He is empowering us into a way of thinking that restores our confidence in Christ, that as we consider the issues from within in partnership with the Spirit, we are elevated to the level that God wants us to live on. 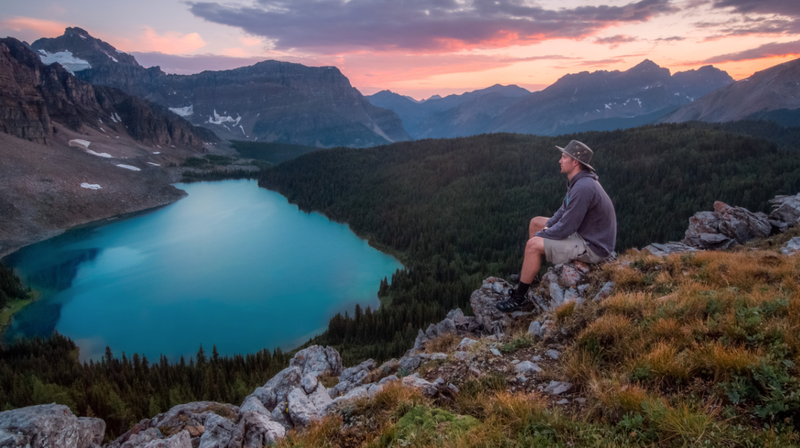 Our new nature is the way God thinks about us. He has no bad thought towards us, because He sees us in the lens of Jesus Christ. Now, He only has a desire to see us conform to the image of Jesus. Remember this today, that God always tells you who you are. You don’t have to deal with the negative anymore. He only invites us to focus on our new identity and on what He is doing inside of today. ps) I share more about God’s positive thoughts about us & what that means for us today in The Art of Thinking Brilliantly. Check it out here. "Why We Are Losing Americans To Prescription Medications?" Very Well Said, Mychal Massie! Do Black Athletes Understand Meaning Of Equality? I watched a black professional football player wax passionately in his complaint that, it isn’t as bad today as when his “mamma” was born in 1955, but blacks today are still fighting for equality. The ESPN program hosts solemnly nodded their heads in agreement. The depth of ignorance the petulant multi-millionaire athlete displayed was stunning. Which brings me to my point. Just what “equality” is it that these blacks are claiming blacks do not have? Do they understand the definition of “equality” or are they arguing for preferential treatment simply because they are black? What these pluripotent complainers are apparently too uneducated to realize is that blacks have the exact same equality everyone else has. And if they bothered to put aside their jaundiced perspective of modernity they would understand that. Equality dictates and defines the ability of all persons to purchase the home of their choice predicated upon their credit and ability to pay for same. Equality dictates and is defined as the ability of all persons to dine, shop, purchase, and lodge wherever they choose based upon their ability to pay. Equality dictates and is defined in the context that a person can seek employment where they wish and reasonably expect to be considered for hiring based upon their qualifications. Just what equality are blacks lacking today? I live in Orlando, Florida. The restaurants we dine at are host to countless numbers of blacks, many of whom are staying in expensive hotels on vacation. I see blacks dining and shopping in the most exclusive stores, as well as in Wal-Mart. Blacks enjoy luxurious time-share rentals just as many others do. For these spoiled multi-millionaire athletes to claim that blacks don’t have equality is a damnable heterodoxy spewed by pernicious calumniators. Even more contradictory to the boorish complaints is that many multi-millionaire athletes live in the same area that I do. It is an undeniable fact that blacks have the same rights and opportunities that everyone else enjoys. It is the choice of what to do with said rights and opportunities that needs to be addressed. If blacks did not have equality they would not be ordering meals in Orlando restaurants from Wendy’s to Christner’s Prime Steak and Lobster to Chatham’s Place with whites taking their orders and preparing their meals. If blacks did not have equality they would not be renting and purchasing homes from Baton Rouge to Wyoming to Anchorage, Alaska. If blacks didn’t enjoy equality they wouldn’t be serviced by white sales persons in every corner of America from a Dollar Tree store to the haute couture stores in the finest shopping districts. Bad police have injured and/or mistreated Americans of every description not just blacks. The truth is that these complainers are stenotopic, and motivated by a bigotry that looks back to a time past that America has had the good sense and decency to reject and overcome. It is an unconscionable act of intellectual dishonesty to persuade other blacks that the misfortune some of them suffer is always based upon their skin color. The Gordian knot that binds the minds of so many blacks is further tightened by these complaining and protesting athletes, many if not most of whom would be serving jail sentences if they did not excel at punt, pass, kick, throw, and shoot (baskets). The message blacks need to embrace is that life isn’t free and bad decisions lead to bad outcomes. They must understand that they can change the definition of propriety but they cannot change the injurious outcomes from same. I am beyond weary with the complaining and accusations of inequality in America. I am equally tired of hearing we need a conversation on race. First of all there is no such thing as “race.” The idea of race is the construct of the social-Darwinists that was embraced by Hitler as justification for his attempted extermination of Jews and the myth of German superiority. What those calling for such dialogue are actually calling for is a conversation on skin color. To which I say, we do not need a conversation on skin color; we need a conversation on personal responsibility and propriety. Instead of resorting to perverse self-serving tautological arguments that are without merit, these athletes need to set examples by going to classes, graduating from schools based upon meeting standards of learning consistent with grade level, having a wife and family not “babies mammas,” staying away from drugs and aberrant behavior, by attending Christ centered churches with their families, and by representing personal responsibility juxtaposed to belligerence and bigotry. It’s about time these people understand that within the realities of life the chance of tragic misfortune hovers about us all. But with that said, what must be understood is that bad behavior and bad decisions lead to bad outcomes. And if people refuse to change their behavior they cannot change the consequences resulting from same. We had a quick trip to Rochester, MN yesterday and are back today--1060 miles in two days! It was time for my 6 month check-up. Makes me very glad I am not an over-the-road trucker! All was well so I don't need to return for another 6 months. So glad to have that over with! My brother sent this to me several years ago. I rediscovered it as I was cleaning out my email. In light of all the controversy surrounding Mr. Trump’s idea of building a wall, now seemed like a great time to post it. How ridiculous that we have gotten to this point! How can we be a country without walls or borders? And then to succumb to the demands of those who have come illegally is preposterous! Whoever wrote this used a really clever way as a means to point out how ridiculous our president’s policy really is. 9. I do plan to get a car and drive in Mexico, but I don’t plan to purchase car insurance, and I probably won't make any special effort to learn local traffic laws. the U.S. from Mexico. I am sure that the President of Mexico won't mind returning the favor if you ask him nicely. On Wednesday last week, we drove to Morgantown, Kentucky, to pick up our new horses. 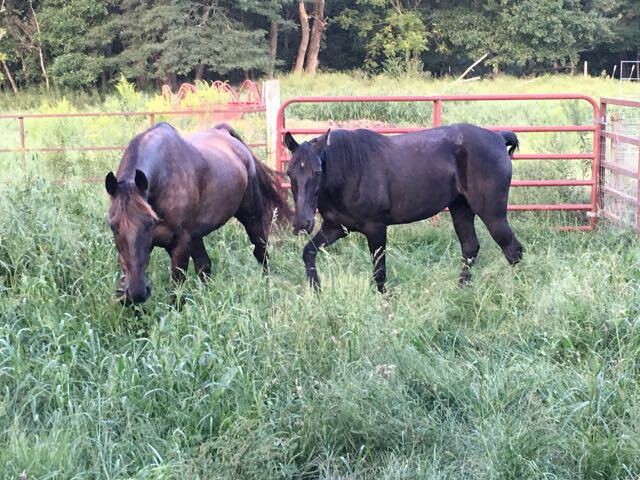 We bought them from a family who rescues horses. Because they want them to go to good homes they give a money back guarantee if you don't like them. This one is mine. His name is Texas. The darker one is named Lady. Both are Tennessee Walking horses which are gaited horses with a very fast walk. We are excited to try them out on trails but are helping them get acclimated to their new environment first. I rode Texas Sunday in the pasture. He did pretty well considering I don't really know how to ride him. I have always ridden Western. 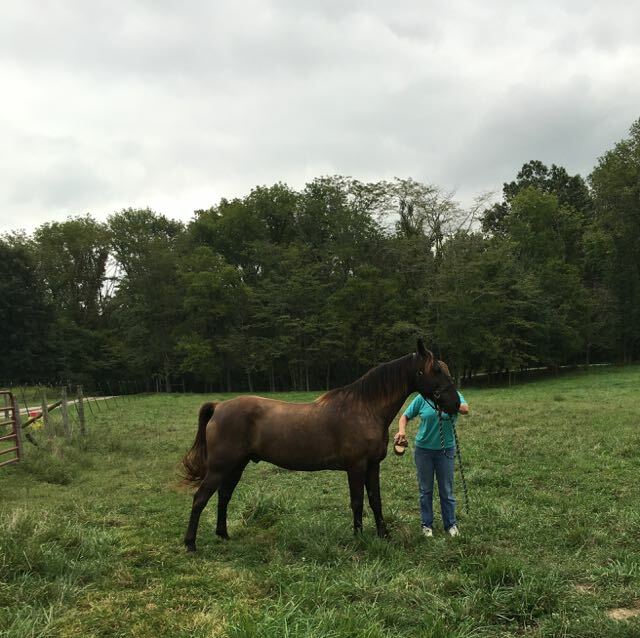 The people who sold him to us said there is a difference in cues so I may have to take some lessons if I can't figure it out myself. They both are very quiet, friendly horses so we are hoping anyone, including guests staying with us, will be able to ride them. 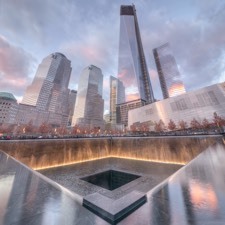 "15 Years Since September 11th: Why We Can Hope Again"
It is the 15th anniversary of the tragic September 11th attacks on the United States in 2001. That was a day that changed the world for us all. The spirit of terrorism entered our lives, and for the past 15 years we have seen senseless terroristic attacks and loss of life around the world. It is important not to allow fear into our lives. We can trust in God and know that He is with us in the midst of uncertain times and storms. 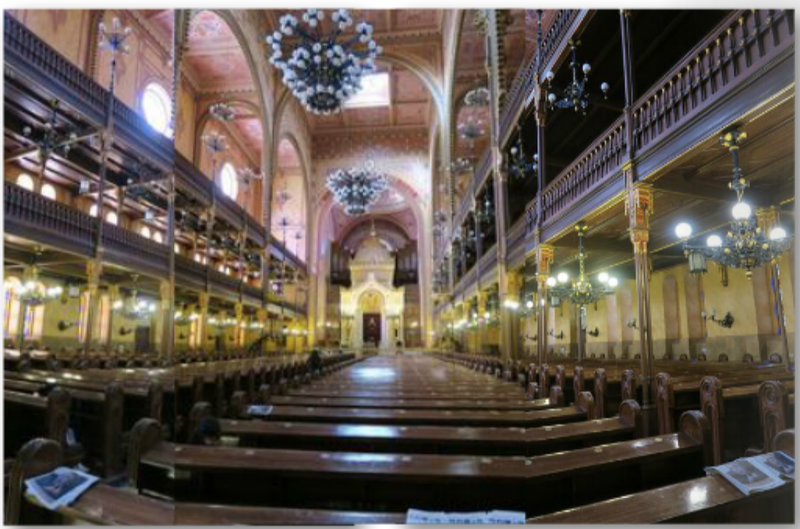 In the Book of Acts, a form of terrorism hit the early Church. Stephan was killed by a brutal stoning; and James, one of the dear friends and disciples of Jesus, was put to death. This caused God to respond from Heaven, and He called the Apostle Paul and many others to rise up. When terrorism hit the Church, God responded with global harvest and a major revival. This is in the process of happening right now. The late prophet, Bob Jones, was killed by satan in 1975. He appeared before Jesus but was sent back to Earth with an amazing prophecy and life mission to set up a billion-soul harvest. The year 2015 was the start of a new 7-year cycle and season. In 2001, we saw a shift come with the tragedy of September 11, and the escalation of terrorism. Seven years later in September 2008, we saw a major financial downturn and the housing market crashed, causing people to lose their investments and homes. This brought a new level of fear and uncertainty into the lives of many. Then 7 years later, in September 2015, we entered into a new season or cycle. There were a lot of negative prophecies about September 2015 that never came about: The global economy was going to crash, martial law would be instated, the rapture and the great tribulation would start—to name just a few. Instead, 7 years after the crash of 2008, in September of 2015, we entered a new 7-year cycle—or season—and we are seeing a turnaround. We have entered into a 7-year time of mercy and blessings from 2015-2022. This does not mean we will not see disasters or have difficult times, but God's mercy is going to triumph over judgment. It truly is a time of breakthrough for those seeking it. I will say it again: God has issued a new 7-year season of blessing. For the most part, it is the result of the prophetic intercessors crying out for mercy. In place of prophetic words of judgment that have been spoken, for the next 7 years, God is releasing the fulfillment of prophetic words that are based in revival and blessing. You will see many of your personal promises fulfilled over the next 7 years as well. God will not be outdone by the enemy. He is still in charge and contrary to what some people are saying, He is not judging us for the purposes of destruction. Instead, God is preparing a surprise release of blessings and promotions that will allow us to reach out to a hurting world. We are going to be part of some of the greatest revivals in history. Get ready to crossover into a new time—one that many have longed to see! As usual, Mychal Massie hits the nail on the head. What has happened to common sense and moral values? America Going From Sandals to Sandals? A reasoned person is looking at America in the context of the present, possibly remembering the adage “sandals to sandals in two generations,” but certainly questioning what has happened? What has happened to the mind of the people who claim to want good government and yet reelect over and over those like Debbie Wasserman Shultz (D-FLA) and John McCain (R-AZ)? President John Kennedy was a lot of godless things but it is safe to say he loved America and worked to enhance her not erode the traditions that had made her great. But Tuesday August 30, voters in my home state reelected Debbie Wasserman Shultz who was forced to step down and chairman of the Democrat National Committee (DNC) because of her uncontested corruption. John McCain has enjoyed a life of failure that has miraculously vaulted him to the heights of influence peddling commonly referred to as “holding political office.” And yet somehow voters valued the corruption and dishonesty to the point of rewarding two people who below in prison with reelection. What has happened to the overwhelming majority of American people who today are barely above an eighth grade reading and comprehension level on the Flesch-Kincaid exam that tests for same? Where is the personal pride of vast numbers of people who would rather complain about something being too hard to read than taking time to master it? What about those who complain about essayists such as myself whom they claim use words they do not understand, but do not take time to look the word up? What has happened to the pride of rugged individuality and self-determination of our forefathers? What has happened to the resolve of the American people who subscribed to the belief that what they dreamed they could accomplish; and thus dared set the bar of achievement high? 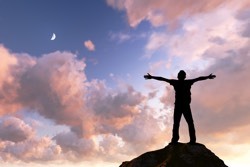 Today people offer reasons for not pursuing a course of self-accomplishment. At what point, I correct myself – Will there come a point in time that people again place a high regard upon real education and propriety? My point being that despite having access to intellectual media today that we couldn’t have dreamed of 50 years ago, personal improvement on an educational level continues to plummet. Has it become the function of schools to under-educate and inculcate a mindset of contempt for propriety and mistrust of accomplishment that is not tied to punt, pass, kick, and throw? When I went to school we actually studied history. We knew, historical dates, periods of time, and historical events. We were taught about historical figures. We pledged allegiance to the flag, we said the Lord’s Prayer, we celebrated the accomplishments of our forefathers. What has happened today? I am appalled at the lack of intellectual curiosity of adults that is passed down to their children. I am appalled at the wanton disregard for the sanctity of the home and family. Television and movies have devolved to Gaycation, Married at First Kiss and Dating Naked. Music has devolved from Count Basie, Duke Ellington, Sarah Vaughn, The Temptations, yes even The Beatles to gangster rap, Suge Knight, and Jennifer Lopez. Explain to me how they promote family and cultural values. People complain about the politicians but the politicians are the face and character of We the People. Our forefathers fought intolerance and extremism. Today these Erebusic commonalities are viewed as values showcasing an honored belief system that by any reasoned characterization of truthfulness can only be viewed as a cult masquerading as a religion. Then of course there are those who cry racism but preach self-inculcated apartheid. I’m an ordained minister and a public figure who has studied and knows history. As an ordained minister I understand that biblically things must reach a point where evil is so prevalent that biblical eschatology is fulfilled. As a public figure who has studied and knows history, I understand the zeitgeist of today and how it was born and unfolded to the present. But I take no solace in that. I’m concerned, but not about Donald Trump, I’m concerned about the mindset of those who would rather see Hillary Clinton in office than him. I’m not talking about Clinton’s politics, albeit I obviously reject them; I’m talking about the corruption that has enveloped her like a death mask since before she left college. Yet, somehow people are eager to dismiss her lifelong career of corruption. I’m concerned about an America that places more of a premium upon feelings than it does truthfulness. I’m concerned about an America in which the standards of absolutes in the Church, the home, our schools, and our military are being destroyed. The meaning of the bromide is civilizations are only able to secure unto themselves success and Godly standards of resolve for two generations before they devolve back into the abyss of pagan godlessness and anarchy. America has set the standard of Godly accomplishment and freedom that has been a beacon for the world. But today America is on the brink of going over the cliff. Sadly, as I’ve heard it said, there’s a lot of activity at the bottom of the cliff but not near enough at the top of the cliff. If there were more activity at the top we could prevent more from going over it and smashing to their demise below. "It's the Duty of Every Christian to Study the Candidates and Issues - Then VOTE!" I am convinced that the direction we take from this point on will determine not only the ultimate fate of our nation, but also the fate of the entire democratic world as we know it today. I have been in Europe seven times since the war. On those visits I have talked with military men, statesmen and religious leaders. Their convictions are probably best summed up by the British historian Arnold J. Toynbee when he says, "The future of the world rests with the United States." If I were a pastor of a church I believe I would... explain to my people where each candidate stood morally, spiritually and in relation to the Church. It's the easiest thing in the world for us as Christians to think of national and world politics as something involving men and women of the world. That's where we fail. Our job as Christians is to make the impact of Christ felt in every phase of life—religious, social, economic and political. 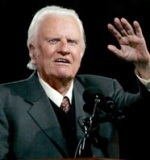 Evangelist Billy Graham took Christ literally when He said in Mark 16:15, "Go ye into all the world and preach the Gospel to every creature." Mr. Graham has preached the Gospel to more people in live audiences than anyone else in history—nearly 215 million people in more than 185 countries and territories—through various meetings, including Mission World and Global Mission. Hundreds of millions more have been reached through television, video, film, and webcasts. 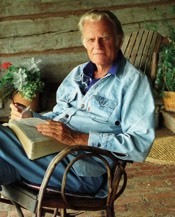 Mr. Graham founded the Billy Graham Evangelistic Association (BGEA) in 1950, headquartered in Minneapolis, MN, until relocating to Charlotte, NC, in 2003. Mr. Graham has written 33 books, many of which have become top sellers. Mr. Graham's counsel has been sought by presidents, and his appeal in both the secular and religious arenas is evidenced by the wide range of groups that have honored him, including numerous honorary doctorates from many institutions in the U. S. and abroad. 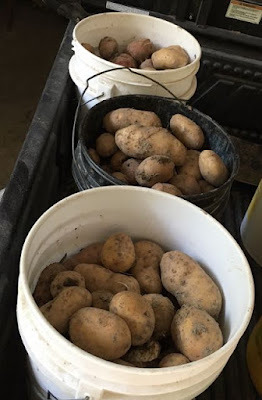 Last weekend we dug potatoes. Whenever I do that I seem to see parallels of the Christian life--like when I first look at the patch all I can see are the overgrown weeds. It doesn't look as if anything is there, but then when we begin to dig we find luscious potatoes. This year Country Guy outdid himself! Some of the potatoes were so large that I probably only need to cook one for the two of us! And we got three 5 gallon buckets full! I'm sure you notice the parallel, too. Isn't that how we view some people--as if there are only weeds with nothing to like about them? But when we begin to dig down and discover who they really are, we find all kinds of treasure beneath the surface. I love to dig potatoes! Help me, Lord, to love looking for treasure in your children just as much. I am excited for our friend, Greg Camp! His new book, which is a compilation of the writings from 1927-1937 of Rufus J. Moseley, has just been published and is available on Amazon for purchase. Here is the link. Greg has been researching and compiling these articles for the last several years and has material for even more books! What an undertaking and what a blessing that Greg has made possible for us to read the many articles of wisdom from this great man of God! As soon as I discovered the book was out, I ordered a copy and received mine yesterday. I have only had time to read the introduction but was very impressed! In the introduction Greg has done a wonderful job of helping us understand who Rufus Moseley was, who influenced him, and who was influenced by him. Here is wisdom from Rufus that Greg included in the introduction: "You are born of the qualities you habitually give out. If you give out hate, you become hateful; if you give out criticism, you become critical. If you give out love, you become lovely. So give out love." Someone asked, "But Dr. Mosely, suppose they don't return your love?" His answer: "Increase the dose!" I highly recommend you get this book. Your life will be forever changed when you grasp the deep revelation that Rufus experienced and imparted through his writings. Thank you, Greg, for a job well done! I spent much of last week working on a photo book of our summer trip to Eastern Europe. I try to do this after every significant trip we take, especially if grandchildren are involved. Since I had taken so many photos (nearly 2000) I was really dragging my feet to get started on this one. To add a little interest, I decided to try a different photo book company. Previously, I had used Snapfish and had no complaints but thought using a new company might get me motivated. After researching reviews I decided to try My Publisher, which had the highest rating on one of the websites. It also had downloadable software which meant I wouldn't have to be online to work on the book. This seemed like it would be a timesaver since we often drive long distances so I could work on it in the car. I first tried this going to Nebraska in July but the uploaded photos were so small I was having trouble seeing them. I soon got very frustrated since I had to add them to a page and then remove the photo if it wasn't what I thought. I even called the company to find out if there was something I was missing. They said that unfortunately their software didn't support enlargements. Because of the high ratings and the fact that I had already uploaded photos and completed a few pages, I pressed on. Using my new and old computers I would choose an enlarged view of the photo on one and add it to the book on the other. This wasn't ideal but I was making progress so I continued. But then the software started freezing up. Needless to say, I was not happy with My Publisher. In fact I was so unhappy that even though I had completed several pages I decided to look for another photo book company. I found Mixbook through reviews online and started over. I lovedMixbook! Hovering over the uploaded photos caused them to enlarge so I could see what I was choosing. The cropping tool was fantastic! I love taking several photos of wonderful views when one can't capture it and then putting them together as a panorama. The tools provided on Mixbook made this easy and fun. There was even a tool to change resolution, saturation and contrast on the photos. This was particularly useful in the panorama scenes to get the skies to blend. Here are screenshots of three of the panoramas in the book. The first one spreads across the top of one page and is a composite of 3 photos; the next is a two page spread--the reason the center looks grayed--and is a composite of 5 photos, and the last is a full page spread of the interior of the Great Synagogue in Budapest. It is a composit of 3 photos. The finished book contains a total of 113 pages. Mixbook had a 50% off coupon so I ordered two books Saturday and received a confirmation saying they would be delivered Sept. 6. Yesterday they came. I also ordered a book on Sunday for a friend who was on the trip thinking I was having it sent to her. I paid $2 extra to have it delivered to her by Sept. 2. Through a mixup on my part it came to me instead and was delivered on Wed. I was very amazed that it came so quickly! Published and delivered in 4 days! The photos were printed with crisp bright colors on heavy paper and seem to be brighter than those in the Snapfish books. I am very pleased with Mixbook and will be using it for future photo books.